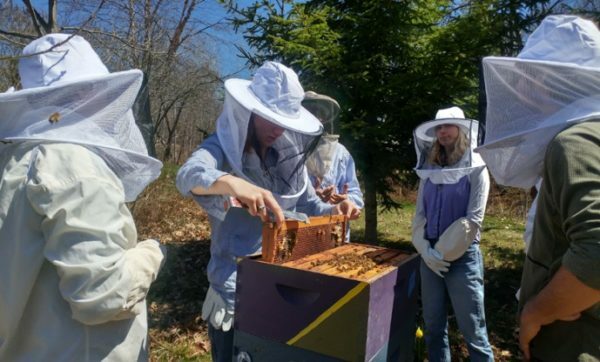 Researchers with the University of Maine and College of the Atlantic are interviewing small- and medium-sized honey and maple operations this summer looking at the decisions that go into management and scales of operation. Working with them are students Skye Siladi from UMaine and Marianna Mead from College of the Atlantic. Specifically, the research team is collecting information from small- to medium-sized producers throughout the state in personal interviews covering their current operations, any plans to expand or downsize, specific challenges to expanding and what factors could come into play to make those decisions easier. For the purposes of the study, a small beekeeper is defined as having fewer than 30 bee colonies and a medium operation as one with 30 to 300 colonies. For the maple syrup producers, the study team wants to talk to small producers with less than 300 taps or medium producers with 300 to 3,000 tapped trees. Leahy said combining research expertise from the two schools makes perfect sense and brings a wealth of talent and ability. At the same time, Collum’s area of expertise on bees and looking at methods of raising more winter tolerant queens is a perfect fit into practical research. Interest in maple syrup production in Maine and how it factors in with multi-generational family operations versus first generation producers is the focus of the University of Maine academic team. “We are excited about real research that benefits real people,” Leahy said. According to the 2018 USDA national maple syrup report, Maine is the third largest producer of maple syrup in the country behind first-place Vermont and second-place New York. More than 1.8 million taps were set last season with a total 2018 maple syrup yield of approximately 539,000 gallons. According to the USDA’s 2018 Northeastern Region Annual Honey Report, Maine’s 12,000 honeybee colonies produced 396,000 pounds of honey in 2017. How producers network among each other and communicate is another area of interest in the study, according to Collum. The sharing of knowledge from one beekeeper to the next is appearing to be a key factor, Velardi said. So far the team has spoken to 10 producers, but Velardi said they are really just getting started. They hope to have the interviews wrapped up by October. So far, Velardi said, the response from beekeepers and maple syrup producers to the study has been positive. Anyone interested in taking part in the study should contact Velardi at 203-583-0181 or sara.velardi@maine.edu.